Nine years ago yesterday, I was 7 months (32 weeks) pregnant with my first child. We knew she was a girl, and she had the pinkest, girliest nursery waiting for her. I was due in late March. Mike and I went to the Flames game that night. And I ate everything I could. Mike drank everything he could. The next day, we became parents. Parents to a 4lb 6oz baby girl that couldn’t breath on her own. This sounds so dramatic. And it was. But it was our normal. We called her “Baby” for a day, and then rearranged the letters. She’s not Abigail. She’s Abby. She spent her first 30 days in the SCN at the Hospital. We slept at home. I pumped milk for her day and night that we fed her through a tube in her nose. Well, the nurses did, mostly. I sat and watched her in that incubator for hours. Then I’d go to the mall. And go back and watch her some more. And I’ve been watching her ever since. Watching her grow, watching her fight, watching her teach herself how to do back tucks. There isn’t a day that goes by that she doesn’t amaze me in some way. And it’s not all good. She amazes me in the way she’s exactly like me. And not the good parts. She gets frustrated easily, is hard on herself, has zero patience and worries. Man, she worries. She’s high strung and anxious, cannot handle change and drives me absolutely nuts. But she’s also funny. And brilliant. Everything she touches turns to gold. Everything she tries she excels at – from reading to swimming to (of course) gymnastics. She gets the physical stuff from her Dad. 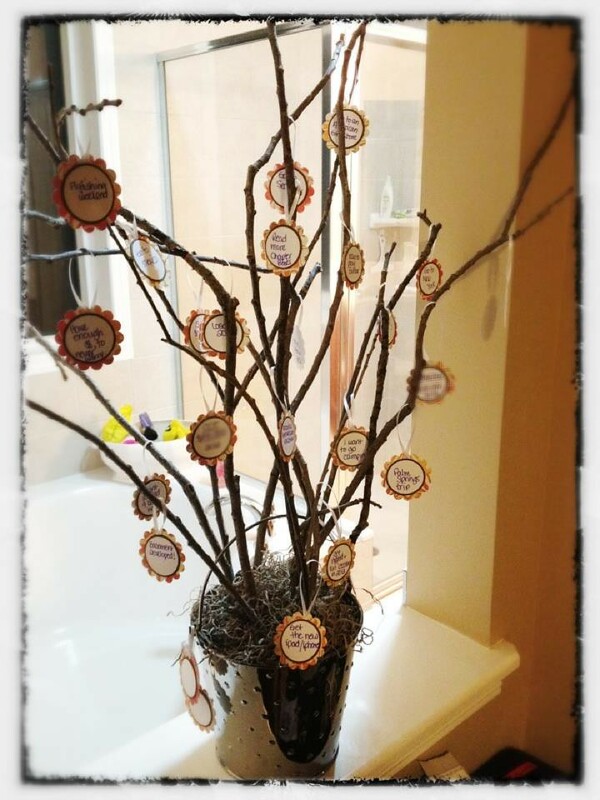 I’ve had several people ask me about the bucket list tree my family did on New Years Eve, so here’s a picture! It’s simply a bucket, with some sticks in it. We hung pieces of paper on it, with our ‘Bucket List’ items on it. The kids got into the fun too. There’s things like “Read more chapter books” (Abby, 8), and “Go camping” (Bella, 5). Most of them are trips that Mike and I want to go on, and things like “Develop Basement” (yes, that STILL hasn’t happened), etc. We are huge believers in ‘Thoughts Become Things”, and the Law of Attraction. I always have a vision board on the go, and this was a fun way of creating a visual for the whole family. When we complete something, we’ll either leave it on, if we want to do it again, or replace it with a new goal.